With Pokémon Go being released earlier this month users of the game have seen their cellphones battery life decrease dramatically, roughly a 10% drop for every 20 minutes of gameplay. Because of this many users are left with a dead phone and unable to “catch them all”. 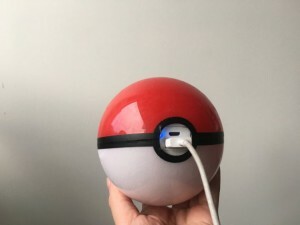 Well fear no more, a seller on Etsy, “magicalsuperstore“, has created a portable phone charger in the shape of a Pokeball. Each one is hand built using a Dremel and has a USB and Micro-USB port with LED lights to indicate the status of the charge. According to the seller, inside is a 5,300mAh battery pack that can charge a phone up to three times. Because they are all hand built and painted, each Pokeball battery charger costs $40 plus shipping.